I bought a 23.5 pound turkey for Thanksgiving. There were four of us. As a result, it will be "Thanksgiving Leftovers Week" at Food Blogga's. 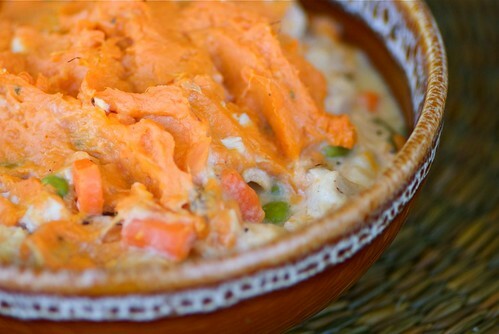 I'm kicking things off with my favorite Thanksgiving leftover recipe: Turkey Pot Pie with Mashed Sweet Potato Topping. This turkey pot pie is chock full of savory turkey meat, tender vegetables, and an herb cream sauce. With the sweet potato topping, it deliciously evokes memories of the recent feast (but without the football this time). 2. In a large skillet over medium-high heat, melt butter. Add onions, carrots, and celery and saute 5-7 minutes, or until just tender. 3. In a medium bowl, whisk milk and flour, until flour dissolves. Add herbs, salt, and pepper. 4. Add turkey to the vegetables. Add the milk-flour mixture. Stir occasionally until the sauce begins to thicken. Stir in the peas. Transfer to the prepared baking dish. Top with mashed potatoes, leaving about 1/2-inch space between the potatoes and the dish. Cook for 20-25 minutes, or until the sauce begins to bubble around the edges and the potatoes are lightly browned. Congratulations to Leslie of Leslie's Cookery! She is the first winner of a Santa's prize for this year's Eat Christmas Cookies and will receive a copy of Elinor Klivans's The Essential Chocolate Chip Cookbook. There are several more Santa's goodies to come. So send over your Christmas cookies for a chance to win! Find out how here. This looks wonderful! One of those rare recipes where you might make the turkey, just so you have leftovers to make this! I love leftovers. That recipe is awesome! We always have a leftover turkey pot pie in my family - it's one of my favourite ways for using up the meat and veg. Love the sweet potato topping idea. Leftover turkey was thrown into a pot pie at our house! It's the only way to repurpose all that goodness. This mashed sweet potato topping is really nice. I WISH I had leftovers! I had two 15 pound turkeys for11 people and by the time everyone took their "to go" bag, we had nothing left! 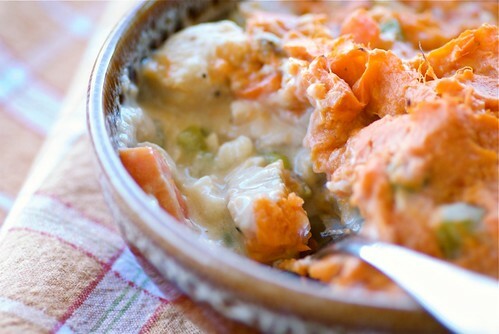 Looks wonderful and I love the use of sweet potatoes! I really like this new twist with the sweet potato topping. By the way Happy Birthday yesterday!! Sorry about the Birthday comment another blogger!!! Take the comment off if you like. Thanks for the link! Hope you are doing well this holiday season! That is one terrific leftover dish. Way to go!!! A wonderful use of the leftovers all over the United States this week Susan. Yum! I'd want to cretae leftovers just so I could make this hearty pie. Christmas dinner leftovers, here we come! I ate no turkey. Fried chicken, all the way. (When in the South...) But I'm down with this pot pie! Brad would love it - post-Thanksgiving. So funny. I was thinking next year I am going to put all the leftovers in the freezer, and take them out when I'm hungry for turkey again. Although this recipe is tempting :). Makes me wish I'd cooked a traditional Thanksgiving meal, just to have leftovers to make this pie. The sweet potato topping sounds great, and I love the color! Oh! I could totally make this GF. Super Yummy! I agree with Lynn, it's worth making turkey just for this! Hi Susan! I made this last night and my family loved it! And I loved it cause it's so much easier than making a crust. Thanks a bunch!! My daughter made this for us and it's amazing! Thanks for sharing. hillary-It's a nice change from the pie crust topping. duodishes-It's the way to go! michele-Ah, yes, the "to go" bags wreak havoc on leftovers. leftoverist-OK. Now that's ironic, since your name is the leftoverist. teachercooks-No prob! It was my dad's b-day, so we'll count it for that. cakelaw-It'll be perfect for post-XMAS leftovers! abby-49th? That truly is hard to believe. I don't ever remember people eating fried chicken on T-Day when we lived in NC. Fried turkey, yes! lisa-I like the color too. christine-I think so. Can you eat cornstarch? anonymous-I love that it's easy too. Thanks for letting me know! lynn-Yay! I'm so happy you liked it. unplannedcooking-I think that's a great idea, actually!